In true Pentax style, the K-1 is one of the best-value cameras in its class. Just make sure you don't pay more than you need to! 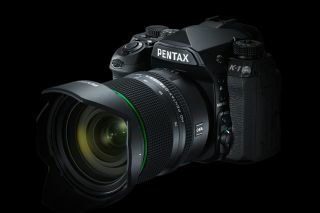 Launched back in February 2016, the K-1 is Pentax's first full-frame DSLR, with a huge range of features against a very reasonable price tag. Built around a full-frame 36.3MP CMOS sensor with no anti-aliasing filter, the camera captures crisp images across a wide sensitivity range and Full HD videos too. True, it can't quite stretch to 4K quality, but it does offer ports for both headphones and an external mics, something that can't be said for all its rivals. The weather-sealed K-1 isn't the lightest full-frame camera around, but it does include features missing from its DSLR peers, such as built-in 5-axis image stabilisation, which offers up to five-stops of compensation. It also matches some of Nikon's offerings in having illuminated controls, although it goes one further with LEDs cleverly placed at the lens mount and inside the dual card slot. Perhaps its quirkiest feature, however, is the innovative 3.2in LCD, which is secured by movable stilts so the LCD can be angled to a very specific position of the user’s choosing. You also get a nice big pentaprism viewfinder, which offers 100% coverage – again, not a universal feature at this level. The Wi-Fi enabled K-1 can shoot a maximum of 4.4fps as standard, although this can be increased to 6.5fps in the K-1’s APS-C crop mode. So, the K-1 isn’t the fastest camera, but this is a DSLR better suited to landscape and portraiture photography to make the most of that high-resolution sensor. One of the most interesting features of the K-1 is its Astrotracer mode, which makes use of the camera’s GPS and Sensor Shift technology to track the motion of the stars. This enables the photographer to capture a long exposure without any visible star trails, which is a highly desirable option for fans of astro photography. Overall, the K-1 is an interesting and rewarding DSLR that punches well above its weight. With a full-frame 36.3MP sensor, it's a hugely attractive proposition for landscape, portrait and astrophotographers that seek detail-filled images, something that's further helped by the absence of that anti-aliasing filter. For action and video of the highest quality you may want to look towards models like the Nikon D850 instead, but if its image quality and masses of clever features you're after, you really can't argue with what the K-1 offers.